In a large soup pot, bring water to boil (add enough so that it will cover the veal roast). Add the vegetables, 2 tablespoons coarse salt and the veal eye of round. Bring water to a boil and let cook for approximately 1 hour, stirring the white foam that forms at the top of the pot. Turn off the stove, letting the meat cool in the broth. Once cool, cut the meat in thin strips and arrange on a tray or platter (depending on when you’re going to serve it). Meanwhile, put hard-boiled egg yolks, tuna and oil in a blender. Liquefy until a smooth, uniform mix is achieved. If you’re not going to serve the vitel toné on the same day of preparation, store in the refrigerator. Otherwise, a few hours before serving, arrange the strips of veal on the serving tray or platter you will be using, and cover with the tuna and anchovy sauce. Sprinkle with capers, and serve with the garnish of your choice. To balance the flavors of the dish, add a toquecito of lemon juice to the broth. You can serve the vitel with lemon wedges, used to drizzle lemon juice over the meat and the sauce. Serve with a white wine, such as a bottle of Chardonnay, Sauvignon Blanc or Pinot Grigio. 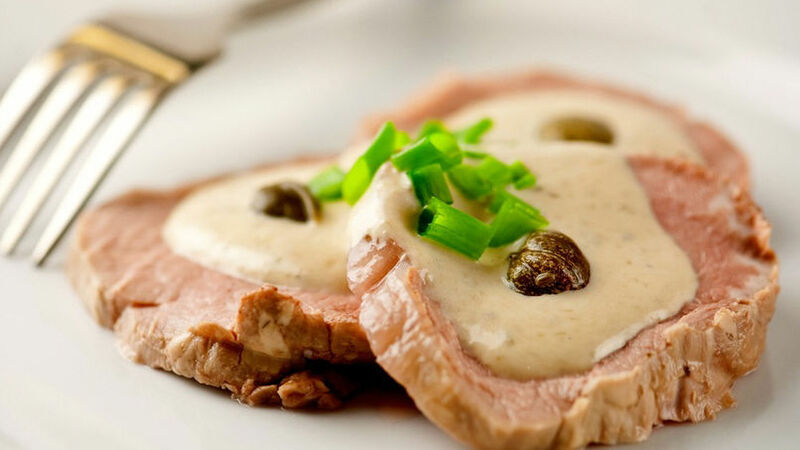 Of all the traditional Argentine meals we can serve this winter, vitel toné, or vitello tonnato (the original, Italian name for the dish means carne atunada) is a classic. During the holidays, vitel toné is a staple on most Argentine dinner tables, served for both Christmas and New Year celebrations. Served as a chilled appetizer, vitel toné combines veal steak with a tuna, egg, anchovy and mayonnaise sauce.